Squash House Quilts: A Special Supreme Meeting! You've probably noticed that I've been absent from Blogland again. This time I have a very good reason! Most of you know I'm one of Stephanie's Supreme Pattern Testers. 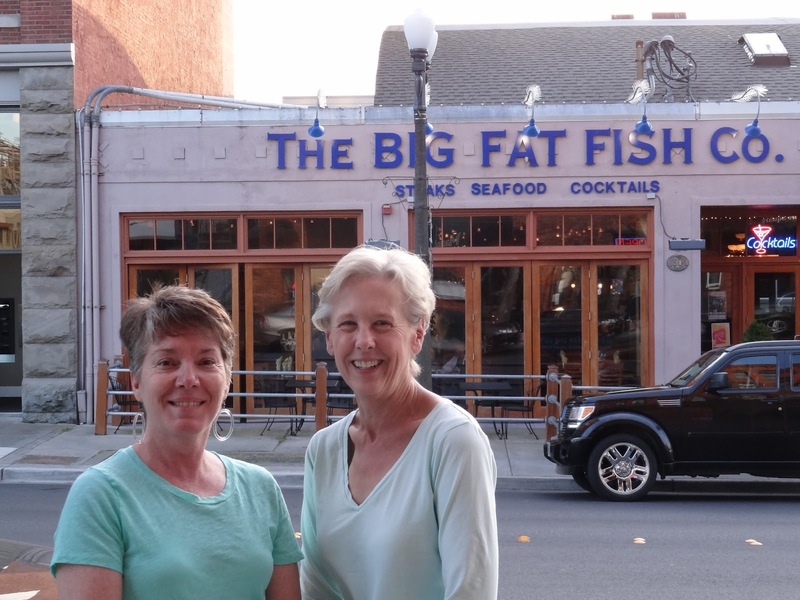 Well, after months of planning and anticipation, Stephanie and I got to meet in person! Here are Mr. Creations and Mr. Squash who got on famously. The next day we visited several quilt and antique shops in the little town of Lynden just north of Bellingham. What fun that was! I must say Mr. Creations and Mr. Squash were wonderfully patient while Stephanie and I had fun shopping! 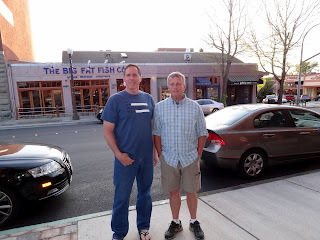 That night we had dinner back in Fairhaven at a great Italian restaurant across the street from Big Fat Fish Company. 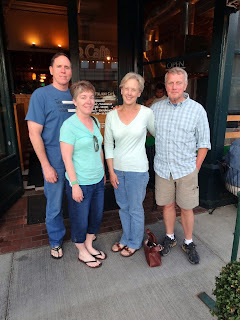 We had been having so much fun that we didn't get any photos taken until then, which is why you see us all in the same clothes at both restaurants! It was sad to say goodbye to them both the next day as they headed back to Ohio, but you never know when we might meet up again soon! Stephanie and Mr. Creations are truly the nicest people! If you ever get the chance to meet personally with any of your blogging friends, I highly recommend it! Stay tuned tomorrow for some of the great goodies I got along the way! It was hard to leave after such a wonderful trip made even better by meeting you both. Did you notice we accidentally coordinated our outfits? I'm envious! I'd love to meet both of you. How how cool to finally meet in person! Looks like you have been friends for years! 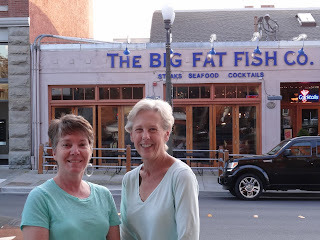 I know when I had the good fortune to meet Laurie (blogging buddy) it was like we'd known each other all our lives! We couldn't quit talking and laughing. She's still a dear friend to me. So happy you got to meet Stephanie! What a treat to get to meet Stephanie. And what a wonderful place to do it!! We have folks who live on Lummi Island just outside Bellingham and we love visiting there. I've never looked up the quilt shops though. Always had other things on the schedule. It must have been so exciting and fun to meet in person! So glad you hooked up. Wish I could have met you. You should have told me you were coming to town! I was born and raised in Bellingham, now live in Lynden. It's a wonderful, beautiful area. Great quilt stores and great quilters! Like I said on Stephanie's blog, I'm soooo jealous! Sounds like you all had a great time and I can't wait to see your purchases. Oh my goodness, glad you were in our corner of the world for a little bit. It is a great place and maybe you were the ones that brought us the sunshine! We were in CA for a week and managed to get into trouble down there..the good kind at Temecula Quilt Co.,French General, and Purl Soho. Now, how fun was that!! that is so awesome that you guys got to meet. I know it was a fun time.